An online store with a passion for keeping kids active & creating fun meal times with bento lunch boxes & accessories. Kids on Abington is a family run, online-only boutique. 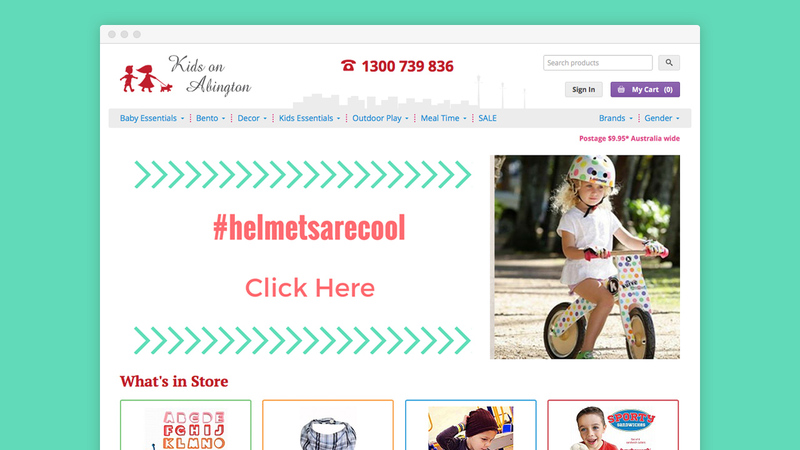 Founded in 2012 by Simone Eastgate, Kids on Abington strives to be Australia's top eCommerce website for keeping kids active and eating nutritious meals. Simone was one of the first clients we took on when starting Warble Media. This was back when Warble Media was Complex Compulsions and Kids on Abington was Cute as a Canvas. Lots of things have changed since we started working together including a full rebrand for both business and multiple fresh website designs. On-site optimisation is a key focus when developing an online store. To help customers find the products they are looking for we built an advanced search feature, category landing pages and the ability to find products by brand and/or gender. Everybody wants the best price when shopping online so we made sure Simone was able to create targeted promotions and discount codes to push customers to checkout. The option to pay by PayPal or a custom built lay-by solution (later replaced by AfterPay) gives Kids on Abington an edge on it’s competitors. The addition of MailChimp newsletters and an integrated blog keeps customers up to date on new products, sales and other news. Incremental improvements have kept the Kids on Abington website feeling modern and alive. With more changes in the pipeline and no end in sight, Warble Media is proud to be Kids on Abington's web design partner.